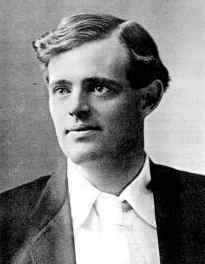 Jack London was born in San Francisco. He was deserted by his father, "Professor" William Henry Chaney, an itinerant astrologer, and raised in Oakland by his mother Flora Wellman, a music teacher and spiritualist. London's stepfather John London, whose surname he took, was a failed storekeeper. London's youth was marked by poverty. At the age of ten he became an avid reader, and borrowed books from the Oakland Public Library, where Ina Coolbirth recommended him the works of Flaubert, Tolstoy and other major novelists. After leaving school at the age of 14, London worked as a seaman, rode in freight trains as a hobo and adopted socialistic views as a member of the protest armies of the unemployed. In 1894 he was arrested in Niagara Falls and jailed for vagrancy. These years made him determined to raise himself out of poverty but they also gave later material for such works as The Sea-Wolf (1904), which was partly based on his horrific experiences as a sailor in the Pacific Ocean. Without having much formal education, London spent much time in public libraries reading fiction, philosophy, poetry, political science, and at the age of 19 gained admittance to the University of California in Berkeley. During this period he had already started to write. London left the school before the year was over and went to seek his fortune in the Klondike gold rush of 1897. His attempt was unsuccessful. London spent the winter near Dawson City, suffering from scurvy. In the spring he returned to San Francisco with his notebook full of plans for stories. For the remainder of 1898 London again tried to earn his living by writing. His early stories appeared in the Overland Monthly and Atlantic Monthly. In 1900 he married Elisabeth (Bess) Maddern; their home became a battle field between Bess and London's mother Flora. Three years later he left her and their two daughters, eventually to marry Charmian Kittredge, an editor and outdoorswoman. The marriage lasted until London's death. Charmian became the model of London's women characters, such as Paula in The Little Lady of the Big House (1916). In 1901 London ran unsuccessfully on the Socialist party ticket for mayor of Oakland. He started to steadily produce novels, nonfiction, and short stories, becoming in his lifetime one of the most popular authors. London had early built his system of producing a daily quota of thousand words. He did not give up even during his travels and drinking periods. London's first novel, The Son of the Wolf, appeared in 1900. By 1904 Jack London was the author of 10 books. The Son of the Wolf gained a wide audience as did his other Alaska stories, The Call of the Wild (1903), White Fang (1906), and Burning Daylight (1910). In 1902 London went to England, where he studied the living conditions in East End and working class areas of the capital city. Originally he set out for South Africa to report the Boer War. His book about the economic degradation of the poor, The People of the Abyss (1903), was a surprise success in the U.S. but criticized in England. London produced this classic of investigative reporting in seven weeks. In the middle of a bitter separation in 1904, London traveled to Korea as a correspondent for Hearst's newspapers to cover the war between Russia and Japan (1904-05). Next year he published his first collection of non-fiction pieces, The War of the Classes, which included his lectures on socialism. In 1907 London and Charmian started aboard the Snark, the author's self-designed ketch, on a sailing trip around the world. On the voyage he began to write Martin Eden. After hardships - his captain was incompetent, the ketch was inefficient - they abandoned the journey in Australia. London's financial affairs were in chaos, his teeth gave him incessant pain, and he began to buy plots from a struggling writer, Sinclair Lewis, to produce more articles and stories for sale. A few months before his death, London resigned from the Socialist Party. Debts, alcoholism, illness, and fear of losing his creativity darkened the author's last years. He died on November 22, 1916, officially of gastro-intestinal uremia. However, there has been speculations that London committed suicide with morphine. Set in the Solomon Islands, this is a story of a coconut plantation and the slavery that exists within it. The story of a man transported by his dreams to a prehistoric community. Tells the story of the Klondike Gold Rush and the corruption that takes place when money becomes involved in relationships. Story of Buck, the crossbred hound, that is stolen by a gardener. Treated beyond cruel, he is rescued by John Thornton, who returns Buck to the wild. The story of a prizefight. Detailing of the rise of the "Iron Heel," a group of Capitalists, and the Socialist revolution that is crushed beneath it. An autobiographical account of London's life that deals with the destructiveness of alcohol. The collected works of Jack London, including, "Love of Life," "The Story of Keesh," "A Day's Lodging," and "The Sun Dog Trail." The story of Martin Eden, an poor seaman who desires, above anything else, to be educated and famous. The detailing of cruelty toward animals. A collection of stories that include, "Moon-Face," "The Leopard Man's Story," "Local Color," and "The Minions of Midas." Collection of short stories, including "War," "The Mexican," and "To Kill a Man." A science fiction story about a man who makes a discovery while dying on an island in the South Pacific. Details the struggles between the sea-captain, Wolf Larsen, and Humphrey Van Weyden. Stories about life in the South Seas, particularly of Samoa, written from the time Stevenson spent there. A collection of short stories set in San Francisco Bay. The adventures of Billy and Saxon Roberts as they search for land to farm. The classic story of a half-wolf, half-dog who, through its life, becomes domesticated.